Our Discussion Forum platform is currently functional. Please visit the Discussion Groups and access the market or industry forum that most interests you. We thank you for your interest and look forward to your feedback. 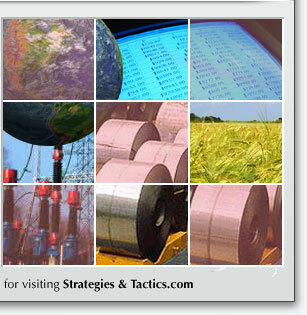 Strategies & Tactics is a portfolio management & risk management consulting firm. Given the rapidly changing and volatile financial environment, our focus is on the disciplined use of derivatives (both OTC & exchange traded) in hedging, trading, and yield/cost enhancement programs for interest rate, equity, currency, energy, metal, and traditional commodity portfolios. The objective of this WebSite is to maintain an interactive forum within which contemporary portfolio management and risk management issues can be discussed and explored. Within this context, portfolio is broadly defined to mean holdings of a) financial securities and borrowings, b) revenue generating production facilities (e.g., oil and gas wells, agricultural and livestock operations'), and c) end-user or mid-processor input requirements (e.g., energy inputs for utilities generating electricity, refiners producing products, airlines transporting passengers'). Also, within this context, risk is defined to mean the price, value, interest rate, and/or exchange rate risks associated with these portfolios. Background - Portfolio Management and Risk Management experience and related Background information on myself, Jim Hight. Philosophy - Portfolio Management and Risk Management Philosophy. Seven major precepts underlying my approach to portfolio management and risk management challenges. Includes comments on the application of Sun Tzu and The Art of War to portfolio management and risk management. Management Process - Portfolio Management and Risk Management Process. The internalization of the on-going capability to make and implement portfolio management and risk management decisions in a consistent and disciplined manner. Analytic Framework - Portfolio Management and Risk Management Analytic Framework. The maintenance of a disciplined analytic methodology and organized data bases that enable systematic evaluations of a given premise and the related conclusion regarding price, interest rate, and exchange rate behavior. Market Analysis - Portfolio Management and Risk Management Market Analysis. The on-going application of the Analytic Framework to the critical industries, entities, markets, and instruments involved in creating and intermediating commerce in the main Global Economic Drivers. The underlying objective is to do this in such a way as to facilitate the development of suitable Strategies&Tactics for implementation within the Portfolio Management and Risk Management Process. Strategies&Tactics - Portfolio Management and Risk Management Strategies&Tactics. The purpose of this section is to assist in the development and implementation of suitable Strategies&Tactics within the Portfolio Management and Risk Management Process. Consulting Services - Portfolio Management and Risk Management Consulting Services. These services are directed towards the portfolio managers and risk managers employed in the critical industries, entities, markets and instruments involved in creating and intermediating commerce in the main Global Economic Drivers.